After dabbling in video pieces over the last few years, entertainment news site HitFix announced today the full launch of HitFix Video. “Basically, for us, video is the way, the hook, the content and the opportunity to get in front of consumers on all of the screens and all of the devices they interact with in their daily lives,” HitFix CEO Jen Sargent said. While the company is known for its entertainment news, HitFix will be creating originals and viral videos in addition to exclusive interviews, live event coverage, breaking news and behind-the-scenes clips. Sargent said the foray into reported video pieces made sense since many people know the site for that content. It saw an opportunity to turn features like movie power rankings, top 10 lists and the Firewall and Iceberg podcast into video content. Other entertainment news sites like Entertainment Weekly and E! have also broken ground in this sphere. But, when HitFix saw that its 18-to-34-year-old audience overlapped with Funny or Die and College Humor patrons, it felt that comedy was the next step. These originals will be in the same vein as Him, a parody of the Academy Award-winning movie Her that the website created in January. “It was an opportunity to create our own voice, given that we are so timely,” she said. The company started making videos on a limited scale in 2010, but it wasn’t until late 2011 to early 2012 that it started building out more of its nontraditional video partnerships. In addition to the website, HitFix video can be seen on various platforms, including movie theaters, thanks to National CineMedia; on college campuses through Campus Nation; and in quick service restaurants via IZ ON Media. 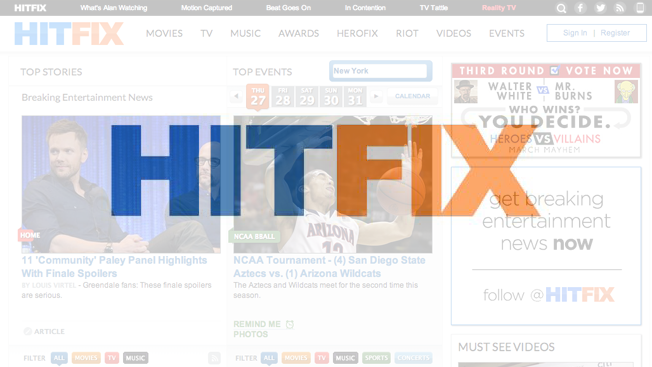 During the soft launch period, HitFix was able to attract advertisers including USA Network, AMC and Summit. Now, it's opening up its content to all advertisers who want to be able to appeal to its highly lucrative millennial demographic. Currently, it rakes in 300 million viewers and 90 million video streams a month.